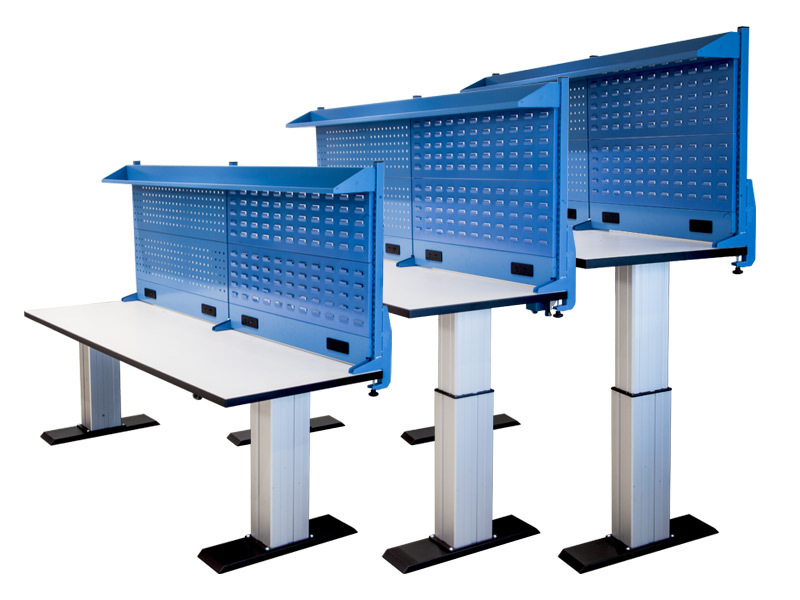 The Boscotek range of modular workbenches provides budget and flexible workspace for a range industrial applications. 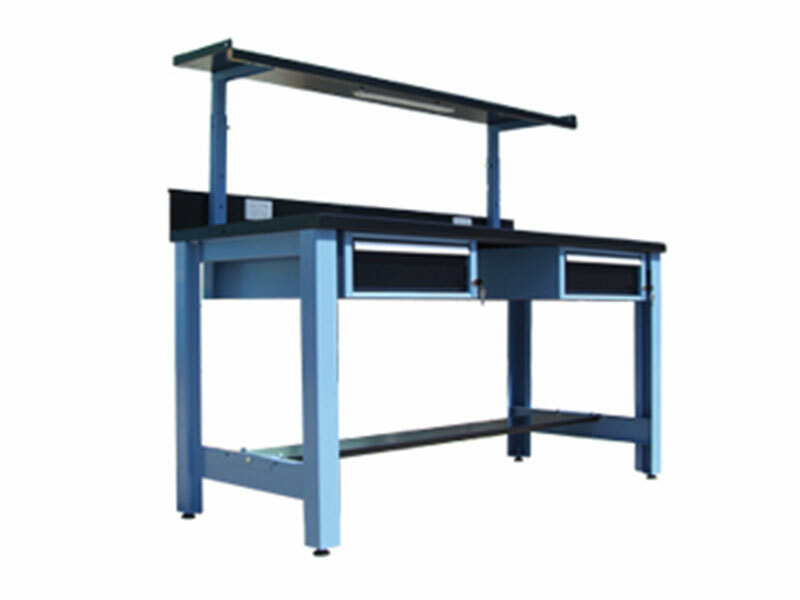 Available in a number of configurations, these cheaper workbenches can be assembled to meet the specific requirements of individual work environments. Used in conjunction with the Boscotek range of storage and drawer units, the modular workbenches form part of a complete, industrial workplace storage solution. Welded 3mm mild steel frame offers excellent structural stability. 3mm mild steel top designed to cope with heavy-duty industrial applications. Workbench will accept a load capacity of 800kg evenly distributed. Available in a range of ergonomically designed heights for standing or sitting stations. 700mm benches are ideal for use as sitting stations and 900mm benches are suited to standing station applications. To ensure a stable surface in all conditions we recommend the use of levelling feet. Levelling feet can be adjusted to accommodate inconsistent or uneven floor surfaces ensuring stability and safety at all times. Heavy duty castors are ideal for creating a mobile work environment. Used in conjunction with Boscotek products. Heavy duty castors provide users with the flexibility to move and reorganise a workspace with minimum effort. Heavy duty castors are capable of handling a load of up to 150kg each on a mobile workbench and are available in fixed and swivel. Make your workbench a workstation with the addition of drawers and cupboards to optimise your work environment. Single drawers can be connected to form stacks of up to three, or six drawer units are available where extra storage space is required. Single door cupboards can be added to workstations to store large or bulky items. Work surfaces come in various types and are arguably the most important aspect of your workbench. Mild Steel, Timber Laminate or Melamine, Hardwood, Anti-Static, Duraloid and Vinyl can all be fitted for task specific applications. Think about the most appropriate workbench top for your application, doing so will allow your work bench to allow for many years. 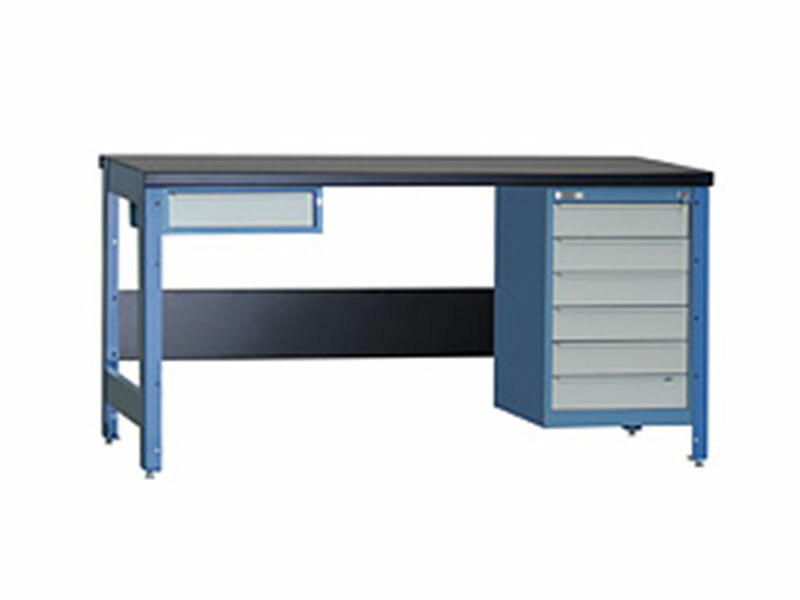 Workbenches are supplied as standard with 3mm black powder coated mild steel bench top unless otherwise specified. Static electricity or ESD (Electrostatic Discharge) can cause significant loss; it can damage electronic devices, attract contaminants in clean environments, ignite explosives, and cause undesired material behaviour during production. Boscotek supply workstation/workbench antistatic kits used for ESD Protection Areas. The kit includes : (1.22m x 0.61m) Static Dissipative Bench Mat, 3m Premium Straight Cord, 1.8m Premium Coil Cord, Earth Facility Bracket, L Shaped Grounding Bracket, Premium Fabric Wrist Strap Adjustable Wrist Band and grounding plug. Height adjustable shelves can be fitted to Industrial workbenches providing storage space for frequently accessed items. Height adjustment accommodates items of various sizes and provides users with flexibility to position shelving at an ideal work height. Adjustable shelf range: Shelf to workbench top minimum 502mm, Shelf to bench top maximum 702mm. 4 x 50mm increments. Power panels can be incorporated into the back or side of workbenches providing a conveniently located power source for desktop applications. GPO not supplied as standard. The Boscotek range of industrial storage products is proudly designed and manufactured in Australia. © Copyright Boscotek 2015. All Rights Reserved.